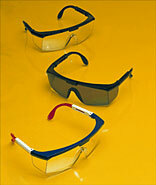 Expo assures full radius eye protection with its integral Verillium lens system. The Duramide frame is flexible, resilient, and tough. A full wide angle browguard shields the top of the eye area to protect from above, while extra large sideshields provide an excellent lateral barrier. Proper fit is just a click away with Expo's 5-stop adjustable sidearms. Wide angle browguard protects against particle entry from above. Curved sidearms conform to wearer's head contours for extra comfort. Molded-in nosebridge for extra comfort. 4-stop adjustable temples deliver proper fit throughout the work day. Trecom Safety Corp, 1020 Randolph Street, Thomasville, NC 27360. Tel: 800-343-4359; Fax: 336-476-0240.